It looks like it's finally going to happen, an actual mission to Jupiter's icy moon Europa — one of the the solar system's best candidates for hosting alien life. Yesterday, NASA announced an injection of $17.5 billion from the federal government (down by $1.2 billion from its 2010 peak). Of this, $15 million will be allocated for "pre-formulation" work on a mission to Europa, with plans to make detailed observations from orbit and possibly sample its interior oceans with a robotic probe. Mission details are sparse, but if all goes well, it could be launched by 2025 and arriving in the early 2030s. This is incredibly exciting. Recent evidence points to a reasonable chance of habitability. Its massive subsurface ocean contains almost twice as much water as found on Earth. The water is kept in liquid state owing to the gravitational forces exerted by Jupiter and the moon's turbulent global ocean currents. The good news is that a probe may not have to dig very deep to conduct its search for life; the moon's massive plumes are ejecting water directly onto the surface. According to NASA, the high radiation environment around Jupiter and extreme distance from Earth are the primary challenges (it took NASA's Galileo six years to get to Jupiter from the sun). 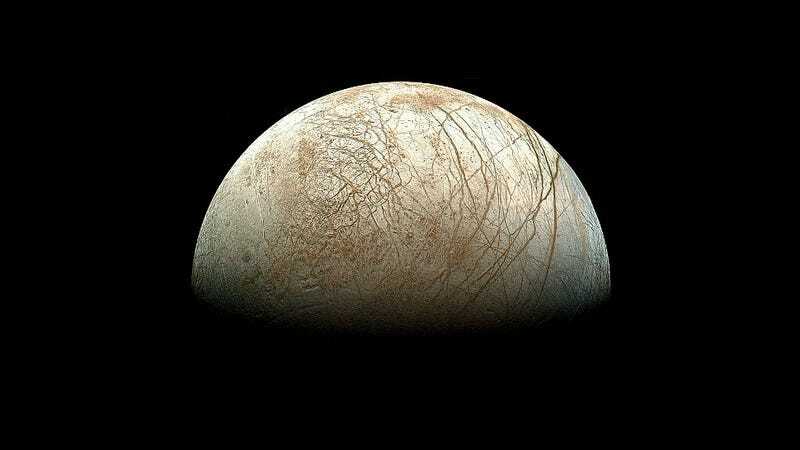 The space agency will now be looking at competing ideas for the proposed Europa mission. NASA is still not sure how big the mission should be, or how much it will cost. Image: NASA/JPL; Copyright: reprocessed by Ted Stryk.